Campaigning officially ended in Pakistan on Monday night, leaving political parties free only to inform voters on where and how to vote on Wednesday. 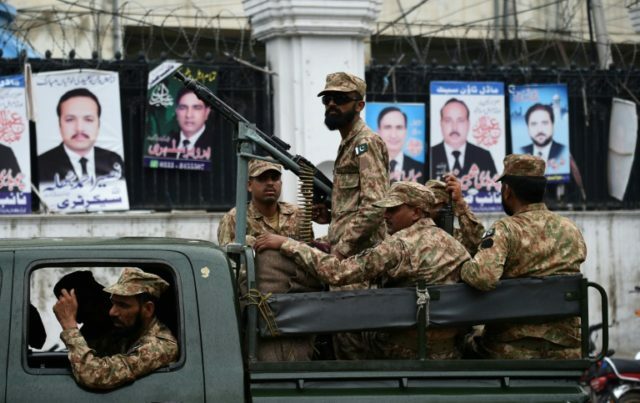 The Pakistani newspaper Dawn notes that the nation’s Election Commission estimates 105.95 million voters will exercise their suffrage rights and the government has deployed 800,000 security officials to protect elections. In addition to them, over 370,000 armed servicemen will be deployed throughout the country to protect polling areas. As of Tuesday, soldiers have already detained five individuals found tampering illegally possessing over 10,000 paper ballots. Yousuf Talpur, the candidate affiliated with the arrested, claimed that they were in possession of legal sample ballots, used to educate voters on how to properly fill out a ballot. Doing so in Pakistan’s current political climate has been a challenge. The Pakistan Express Tribune referred to this campaign season on Tuesday as “one of the most chaotic, dangerous and distasteful election campaigns have come to an end,” lamenting “slurs, mudslinging, blasts and dragging rivals into controversies with show[s] of political power through every tool of communication.” Specifically, the newspaper notes the deaths of three candidates in terrorist attacks – Tehreek-e-Insaf (PTI) candidate Ikramullah Gandapur, Balochistan Awami Party (BAP) Siraj Raisani, and National Party candidate Haroon Bilour. The suicide attack that killed Raisani also resulted in the deaths of 150 others, the deadliest terrorist attack of its kind in the country since 2014. Another candidate, Jamiat Ulema Islam-Fazal’s Akram Khan Durrani, survived two attacks. Several regions of Pakistan have also been forced to shut down elections entirely. Last week, officials expressed concerns that ballots could not be printed in time because so many candidates – over 100 – had pending legal disputes with the election commission, most appealing rulings against their appearing on the ballot due to accusations of illegal behavior. By Tuesday, eight national and provincial assembly constituencies had canceled elections either because candidates had been disqualified, killed, or, in the case of Pakistan Muslim League-Nawaz (PML-N) leader Hanif Abbasi, sentenced to life in prison. PML-N is one of two major parties contesting the elections, the other being the Pakistan Tehreek-e-Insaf (PTI). The PML-N, home to the family of former Prime Minister Nawaz Sharif, is reeling from extensive corruption allegations related to the release of the “Panama Papers,” which revealed Sharif hiding a significant offshore fortune. The opposition PTI, led by former cricket player and longtime political icon Imran Khan, has campaigned against the “gross mismanagement” of national finances under the PML-N. The elections have attracted significant interest from Islamist and jihadi groups as well, however, such as the Lashkar-e-Taiba (LeT) and Lashkar-i -Hangvi (LJ). Over 265 candidates on the ballots as of the beginning of the month had ties to these violent groups. Nearly 3,000 candidates were facing criminal charges, many since removed from the ballot. The result has largely been a campaign centered around Islamist issues such as the blasphemy law. Insulting Muhammad in Pakistan is a crime punishable by death, which crimes such as insulting Islam generally can result in extended prison sentences. The law is increasingly popular among Islamist voters. This month, one candidate, Khadim Hussain Rizvi of the Islamist Tehreek Labbaik Pakistan Ya Rasool Allah (TLP), promised that he if had control over Pakistan’s nuclear weapons he would “remove Holland from the face of the earth before they can hold a competition of caricatures. … I will wipe them off the face of this earth.” Rizvi was responding to the holding of a Muhammad drawing contest in the European country.